On October 8, 2016, Hurrican Matthew severely damaged Grand Strand area piers. Myrtle Beach and the Grand Strand are known for their seafood, so you can be sure that the Grand Strand also offers great salt water fishing! 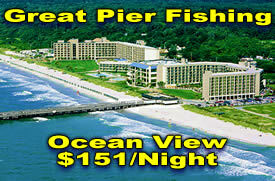 Actually, Myrtle Beach offers some of the best ocean fishing along the East Coast. Visitors to the area can enjoy a variety of fantastic fishing including deep-sea fishing from area fishing charters, fishing from the surf and of course fishing from local piers. For over 35 years Apache Family Campground and Pier has offered visitors to the Grand Strand great fishing and family entertainment on the pier's covered stage. Open 365 days a year, the Apache Pier is the longest wooden fishing pier on the East Coast. The Apache Pier has an oceanfront restaurant and a full service bait and tackle shop with rods & reel rentals, bait & tackle and much more. Come on down to the Apache Family Campground and Pier this summer and find out why it has become a family fishing tradition! Built in the early 1950's the Cherry Grove Pier in the Cherry Grove section of North Myrtle Beach, is home to some amazing, world record catches including a 1,780 pound Tiger Shark (caught by Walter Maxwell in 1964). The Cherry Grove Pier has been family owned since its purchase by the Prince family in 1965. A survivor of numerous hurricanes and storms over the years, the Cherry Grove Pier has been remodeled and lengthened (most recently after 1999's Hurricane Floyd). The 985 ft Cherry Grove pier is the only privately owned pier along the Grand Strand with a two story observation deck. The pier also provides fishermen with a full service tackle shop offering everything you need for an exciting fishing trip. They have a full line of rods & reels, tackle, bait and much more. Catches from the Cherry Grove Pier include King Mackerel, Pompano, Spots, Whiting, Bluefish, Red Drum, Sea Trout, Sheepshead, Summer Flounder, Specs and Gray Trout. Visit the Cherry Grove Pier today for a fun filled fishing adventure for the entire family. Voted Best of the Beach by readers of the Sun News, the Springmaid Beach Pier is the longest pier in Myrtle Beach. Springmaid Beach Pier is 1,068 ft long, 36 ft wide and has a 110 ft T at the ocean end of the pier. In addition to great saltwater fishing, the pier provides a magnificent view of Myrtle Beach and the Grand Strand coastline. On Springmaid Pier you can visit the Fish Tales General Store for groceries, T-shirts, beach accessories & more or stop by the Tackle Box and pick up everything you'll need for a day of fishing. If you get hungry, you can enjoy casual dining overlooking the beautiful Atlantic Ocean at BARnacles Bar & Grille. Nestled at the southern end of Ocean Boulevard in front of the DoubleTree Resort by Hilton, Springmaid Beach Pier is conveniently located near everything Myrtle Beach has to offer. Originally built in 1953, the Surfside Pier is located at the end of Surfside Drive in Surfside Beach, South Carolina (just minutes south of Myrtle Beach). The pier is currently owned by the city of Surfside Beach. Pier Outfitters Tackle Shop at the Surfside Pier carries a full line of rods & reels, tackle & bait plus everything you will need for a fishing outing. The pier's Gift Shop carries everything from bottled baby sharks to designer figurines including jewelery, picture frames, beach toys, sea shells, beach signs, T-shirts and hats. They also have beer and wine for on pier consumption. A wide variety of fish are caught from the Surfside Pier including Spots, Whiting, Flounder, Red Drum, Spanish Mackerel, Blue Fish, Tarpon, Summer Trout and Spade Fish. For great oceanfront accommodations right beside the Surfside Pier, check out the Surfside Beach Resort. The resort features a variety of rooms with mini refrigerators, coffee makers and free wireless internet access. Oceanfront and ocean view units are available with a private balcony overlooking the pier. Ready for a fishing getaway to Myrtle Beach, South Carolina? 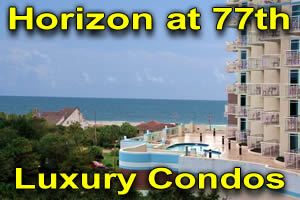 Check out this selection of Grand Strand condos and oceanfront resort hotels.